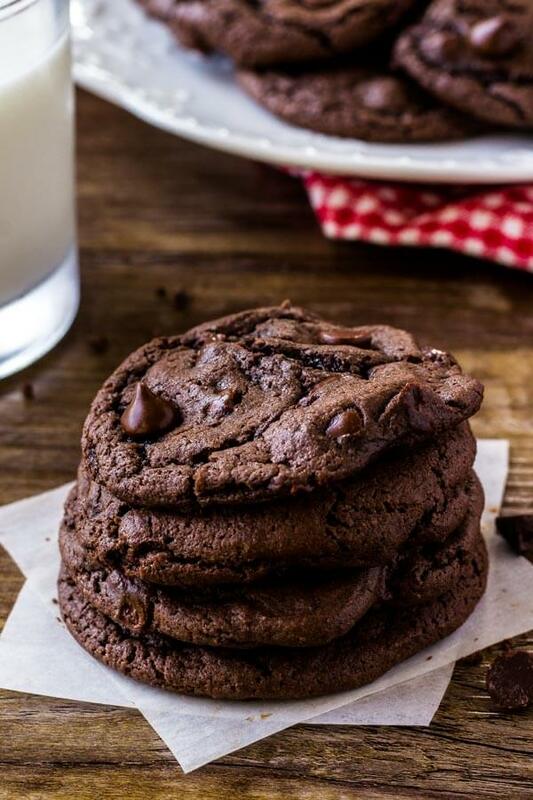 Chocolate Cake Mix Cookies - Soft, chewy & Only 4 Ingredients! 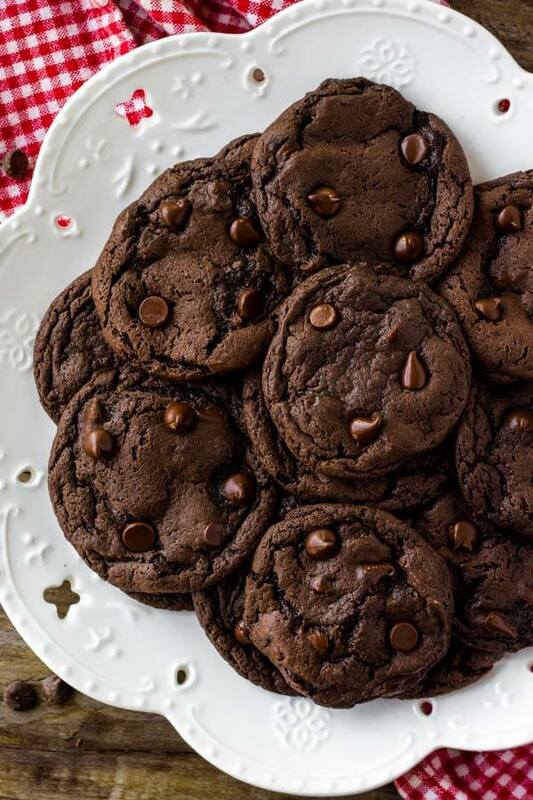 These easy-peasy Chocolate Cake Mix Cookies are soft, chewy, and a little fudgy. 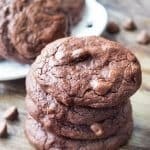 The recipe only requires 4 ingredients, so it’s the perfect easy chocolate cookie recipe for whenever the craving hits. I’ve made a lot of chocolate cookies in my day, but I don’t think you can ever have enough chocolate. 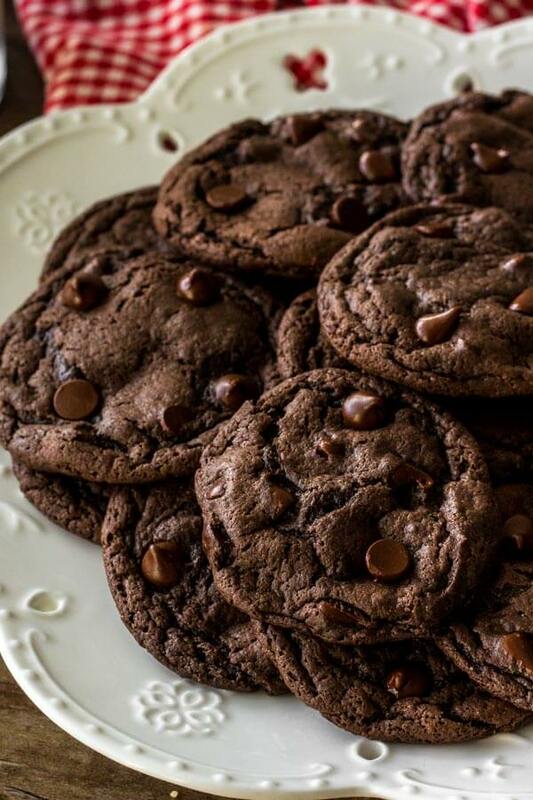 So today I’m sharing the easiest recipe ever – chocolate cake mix cookies. 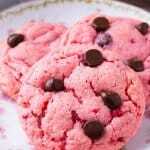 They turn out perfectly fudgy and super soft, and even if you’re a little apprehensive about baking, you can easily make these cookies. Some recipes for cake mix cookies use oil – but I found that cake mix cookies with butter have a chewier, more cookie-like, and less cake-like texture. If you only have oil on hand, you can use 1/2 cup oil instead of 1/2 cup butter. First, you’ll beat the butter, eggs and cake mix. Then mix in the chocolate chips. Form the dough into balls, place 2 inches apart on a lined cookie sheet, and bake. The dough is definitely sticky, so I absolutely recommend using a cookie scoop. If you don’t have one, then lightly grease a tablespoon and your palms to reduce sticking. If your box of cake mix is 15oz (which is what I used), you’ll need 1/3 cup of butter. But if it’s an 18oz box, I recommend using 1/2 cup butter instead. 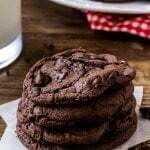 Feel free you use your favorite brand of cake mix – I’ve made these chocolate cake mix cookies with Duncan Hines, Betty Crocker, and supermarket brands with great results. Love cake mix recipes? Try these other favorites: Lemon Cake Mix Cookies, Homemade Fudgee-O Cookies, or Strawberry Chocolate Chip Cookies. 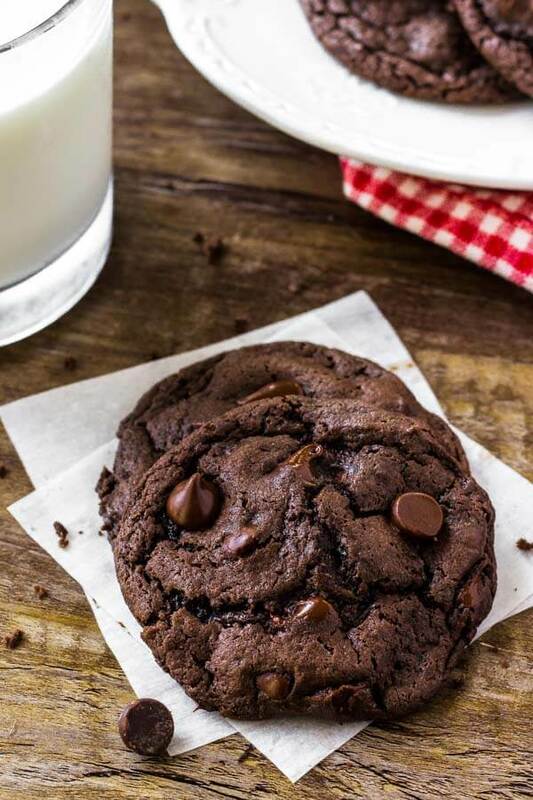 Chocolate Cake Mix Cookies are soft, chewy, and a little fudgy. 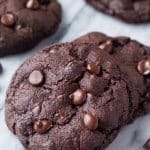 The recipe only requires 4 ingredients, so it's the perfect easy chocolate cookie recipe for whenever the craving hits. Preheat the oven to 350F degrees and line 2 cookie sheets with parchment paper or baking mats. In a large bowl using beat together the butter, eggs and chocolate cake mix. Using a cookie scoop* spoon the dough into balls about 1-1.5 tablespoons in size and place 2 inches apart on the cookie sheets. Bake for 8-10 minutes, or until the tops look set. Optionally, place a few chocolate chips on top of each cookie. *If your cake mix box is 18 oz, use 1/2 cup melted butter instead. **If you don't have a cookie scoop, lightly spray your palms and a tablespoon with cookie spray then form the dough into balls about 1 tablespoon in size. The dough will be sticky, which is why I recommend lightly greasing your hands and the spoon.